This black wooden trinket box is the perfect place to keep all of your treasures! With a secret latching mechanism for access control, only you will know how to get to the treasures kept within. 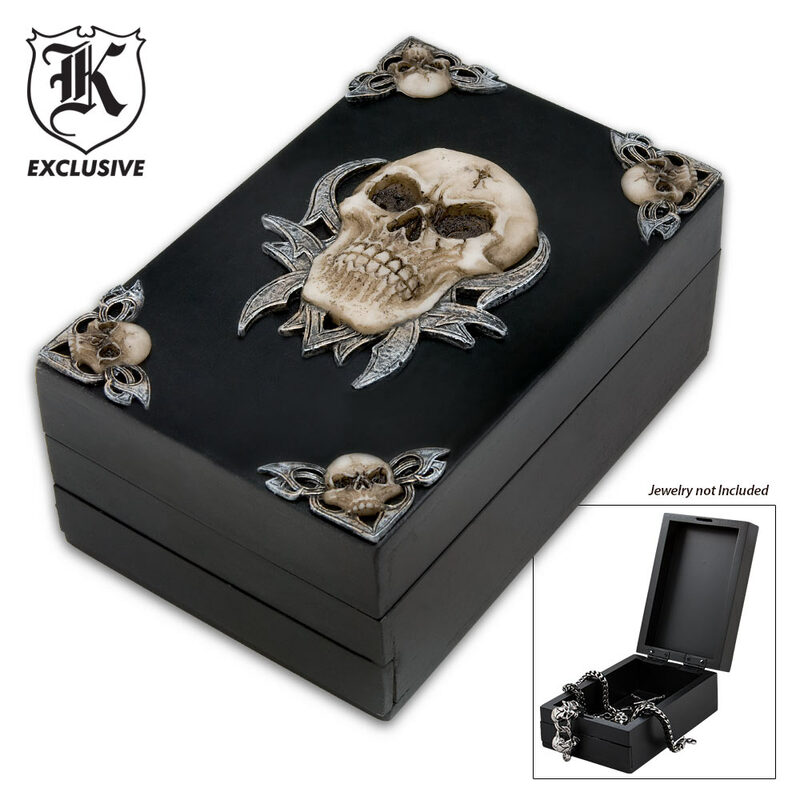 The top of the box features a poly resin skull shield in the center and small skull shields in each corner for the perfect fierce look! I ordered this on a buy one get one free. I though it was very cool. I gave the other one to my son. He has a lot of skull items in his bed room. He loved it. The only thing is opening it when you first get it. I kept pulling thinking it was stuck. Then I looked at it closer, the front bottom slides to your right allowing the box to open. Now that everyone knows this it will help. A few weeks after I got the boxes BudK had another buy one get one free. So I got two more for my grandsons. They will get it on Christmas I think I'll tell them it came from Santa-BudK. Nice trinket box, it can be used for change, or keeping your wallet in it or lots of other small stuff. This is a very cool box. The skulls are not cheap plastic, they're resin. It's a little smaller than I expected but still very cool. 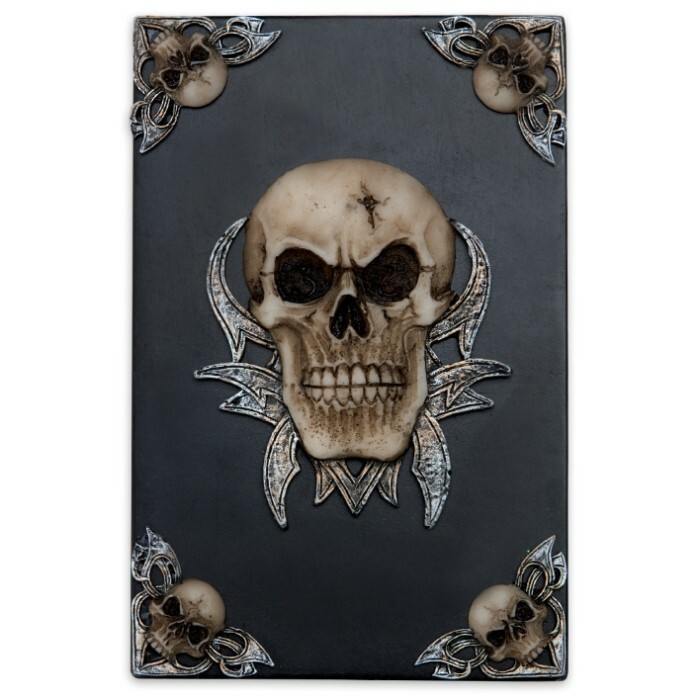 This grimly elegant box was a birthday gift and I fell in love with it. It is perfectly proportioned for small items I keep on my desk. It is well-crafted and eye-catching. Got my first order from Budk. Everything met expectations except this box. The dimensions are not mentioned so I took a chance and ordered anyway. It is definitely a trinket box and not a treasure chest. Only about 2-1/2" tall/deep, 4" wide and 6" long. The "secret latching mechanism" is obvious (fortunately since there were no instructions which goes to show that anyone is supposed to be able to figure it out). It is pretty cool, though. So overall I am satisfied but not sure it was worth the price.